It is rumored that Shah Jahan had the hands of everyone who worked on the Taj Mahal cut off to ensure that a monument as beautiful as the Taj was never built! 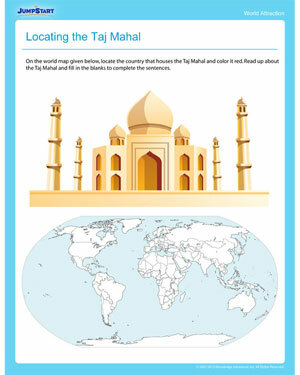 Such stories abound and in this free social studies printable , fourth graders will learn a bunch of interesting facts about the famous historical monument. This worksheet for kids also serves as a geography worksheet as fourth graders will have to locate the country that houses the monument, spot it on the world map and color it. Also check out other fun fourth grade worksheets while you're at it.